More than 19 tons of octopuses have been harvested following a three months closure of fishing activities, earning millions of Tanzania shillings to the fishing community of Songosongo. This is the biggest octopus catch ever to be recorded in four days. This achievement is the result of joint efforts between WWF, the Government, local communities and private sectors. The community gets support from investors in their area including a hotelier in Fanjove Islet who provides them with fuel and patrol boats. The community accepted the fisheries closure system where a selected fishing ground will be completely closed for three months and agree on when to open the fishing. Fishing closure scheme is one of the management measures to allow stock replenishment and habitat restoration. This is the second time that a closure system has been implemented in the fishing areas of Songosongo.The first trial closure was between November 2017 and February 2018. When fishing was opened the catch was 10,821 kilograms (10.8 tons) worthy shillings 43,284,000. The second closing started in mid-May 2018 and on 11 August 2018 fishing was opened for four consecutive days. The total harvest recorded is 19,272 kilograms worthy shillings 77,088,000. This is the amount of money that entered into community systems in four days and is perceived as an important step towards improving community livelihoods. 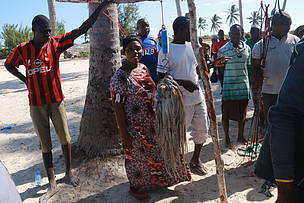 Fishers sell their catch to dealers who further sell to the processing plant, Tanpesca, in Mafia and Kilwa Kivinje. Processed octopus is exported to the international markets in Europe and Asia. Some of the catch is supplied to the tourist hotels but also in the local market throughout the country. The opening day attracts many stakeholders including academia and researchers who come to collect data for research and monitoring purposes. All community members have an equal opportunity to go out to fish and one kilogram is sold at shillings 4,000. Songosongo has a population of 6608 people as of 2012 census; fishers are 205 out of which 53 are women and 152 are men. Songosongo is recognized as an important and productive site for octopus fisheries along the Tanzania coastline. The Government recognizes the contribution WWF is making to promote sustainable management of marine fisheries resources. WWF played a key role in promoting the closure scheme by raising awareness to the community, facilitating learning and experience sharing but also monitoring and surveillance during the closed period. Octopus fishery scheme has also been adopted in Somanga and Songomnara communities in Kilwa District and Jojo and Banja communities in Mafia District. Other places in Tanzania where octopus closing scheme is practiced are in Zanzibar especially on Pemba Island. Other countries in the South Western Indian Ocean practice fishing closing system including Madagascar and Mozambique. Communities buy-in to conservation interventions that bring tangible results in a short period of time. Octopus fishing closing scheme is foreseen to bring economic impact to the fisher communities and potentials of maintaining the initiative using own resources are high.